In July 2011 I was sitting indoors at the Amelia Island Plantation watching the British Open as it was a rainy day on the island. With my lovely wife, Michelle, shopping at the antique stores in downtown Fernandina Beach and my wonderful kids, Merritt and Henry, spending the morning at the plantation kid’s camp, I started thinking how nice it would be if I were sitting in a comfy leather chair, smoking a fine cigar and conversing with fellow cigar smokers while watching the Open Championship. Unfortunately, there was no such establishment in existence within a reasonable drive time of the island. A short time later that morning, lunch rolled around, and yours truly made the short 2 mile drive north on A1A to the Harris Teeter to grab a sandwich for lunch. On the drive, I noticed a For Sale by Owner sign in front of the old Waterwheel Art Gallery building and my mind was thinking “that sign was not there yesterday”. My real estate instinct took over and within minutes I was on the phone with the lender who had foreclosed on the property just days before. After some discussion with the lender, my thought was that I could purchase the property at a substantial discount to new construction and the roughly 50 year old structure was not appealing to many folks, so the building was able to be purchased at a very reasonable price. It probably didn’t hurt my cause that we were in the middle of arguably the worst recession of my generation. 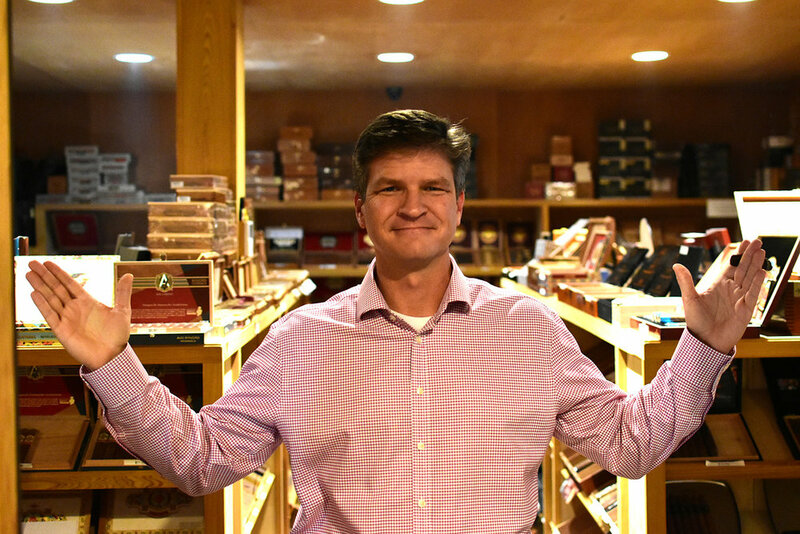 After minimal due diligence and understanding the zoning and permitted uses, I decided the building would be an awesome location for a cigar store. By the end of 2011, we purchased the building and had the entire inside of the building ripped apart. Everything was demolished but the slab floor, columns and roof. The interior of the building was lined with antique cypress wood and we managed to remove every nail and screw and reuse all of the cypress wood for the interior walls. By May 2012, we had run county water and sewer to the building (it was previously on septic), completely reconstructed the interior with a full 1,500 SF smoking lounge complete with abundant seating areas, flat screen TVs and lockers. In addition, we added 2 five ton HVAC units, a smoke master and great ventilation for a lounge that you can have a cigar and then not smell like a cigar when you walk out the door. Complete with the walk in humidor, two ADA compliant restrooms, a kitchen and other offices and private rooms, the store was ready to open for business on Memorial Day weekend 2012. Waterwheel Cigar Store is located next to the historic Vaughan-Scott Cemetery. You can read more about the cemetery and it's history here.